It’s National Zoo Keeper Week and we’re sharing the love! To recognize the dedication and hard work of our amazing zookeepers, we are posting an interview of a keeper each day this week. This individual still has a soft spot for penguins after she transitioned from a zoo volunteer to a full-time keeper. A: “I’ve always had a passion for animals, but I would have never guessed that I’d end up a zookeeper. I was a psychology student at the University of Calgary and decided to take some primatology courses as options classes. I was quickly hooked. I ended up completing two degrees, a Bachelor of Arts in Psychology and Bachelor of Science in Anthropology! During that time I completed primatology fieldwork and research in Belize, and here at the Calgary Zoo. Meet Michelle Benzen, one of the featured keepers during National Zoo Keeper Week 2016. Q: When did you start working as a zookeeper for the Calgary Zoo? A: “It hard not to fall in love with all the animals you work with, but I definitely have a few favourites for a few different reasons. Our golden eagle, Fran, is an individual stand out for me. She has so much personality and is really fun to interact with! Fran was a rescue bird and is missing half a wing. She still has all the spirit and attitude of a large predatory raptor, but also has a softer side and allows you to get up close and hand feed her. She can be so serious at times but also very playful. I’ve recently been trained with the bears (black bears and grizzly bears) and the cougars – they’re also incredible to work with. They are very smart animals and every day keep you mentally and physically on the go. A final favourite of mine in the Canadian Wilds is the whooping cranes. Without the continued efforts of conservation institutions like the Calgary Zoo, this species would be extinct. While our captive breeding program is based out at the zoo’s Devonian Wildlife Conservation Centre, I feel privileged to work with a few individuals here on grounds. 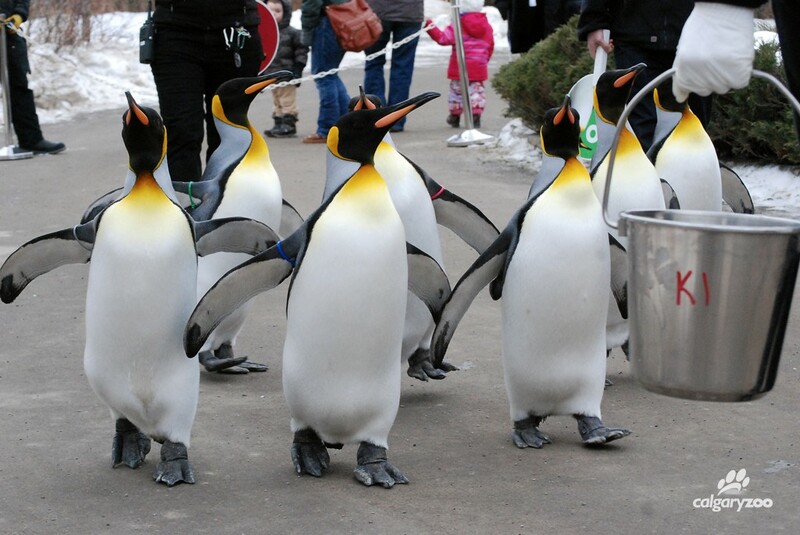 The king penguins go for their daily Penguin Walk in the winter months. A: “I spent most of last summer working with the penguins and was lucky to be there when both Emilio, our first Humboldt chick, and Nero, our first king chick, were born. It was really exciting for the whole team at the zoo to have both of these species successfully hatch, and raise chicks for the first time. Since we strive to provide as much of a natural experience as possible, both sets of first time parents cared for their offspring while we kept a close eye on them. About a month after Emilio was born, we got our hands on him for the first time to conduct his first veterinary check-up. It was a special moment for me as I got the opportunity to crawl into his burrow and bring him out. It is definitely one of my favourite moments so far! It was very surreal (and so adorable) to holding a baby penguin. Don’t forget to follow the rest of National Zoo Keeper Week 2016! We’ll be posting a video of a different zookeeper each day from July 17-23.